It is chronic process that causes the damage of teeth; it evolves on the surface of the tooth and spreads towards the pulp. Dental caries is the most common human chronicity. Pellicle, nutritional and dental hygienic habits, micro-organisms in the oral cavity, heritable and environmental factors can all result in dental caries. Initially it can be reversed with a fluoride treatment, but later on it extends deeper, producing a cave that can be treated only with filling. It evolves on surfaces that are hard to clean, such as occlusal fissure and tooth surfaces beside the gum or close to each other, if the patient does not use dental floss. Fissure sealing is used only on permanent teeth. The cross-section of the occlusal fissure is shaped like a sand-glass; bacteria reach the inner, easy decaying layers of the tooth through a micrometre sized gap, thus damaging the tooth, often in an unnoticeable way. During the treatment the surface of the tooth needs to be cleaned first (without drilling) then covered with a special filling that flows into the fissure thus blocking the way of pellicle which contains several bacteria. The treatment is recommended only for permanent teeth (around the age of six). This efficient intervention can be carried out not only for children but for adults, too. Advantages: it is a painless treatment; with its help healthy and long-lasting teeth can be preserved, besides, it is cheaper than any kind of filling. Aesthetic filling – that is the same colour as the original tooth – plays an important role in both conservative and aesthetic dental treatments. During the filling procedure – in case of smaller or average size dental caries – we use high quality, aesthetically outstanding materials that harden on exposure to light; and in the meantime, only a minimal amount of bone needs to be removed. These aesthetic filling materials incorporate (mechanically and chemically) into the tooth, besides, they are wear-resistant. Aesthetic filling is absolutely suitable for replacing amalgam filling. Previous to the treatment, there is a thorough dental examination with X-ray, besides, the patient receives information about the forthcoming procedure: the anaesthetization, the dental materials and the potential complications. It is recommended to have a meal before treatment, as the patient is not allowed to eat after the anaesthetic injection, as long as the numbness lasts (two or three hours). The treatment is executed with local anaesthesia. First dental caries are removed with a drill then – in order to avoid the potential sensitivity after the intervention – the dentist relines the tooth. Thus, a kind of a “seal” is set between the filling and the bone. Afterwards a thin layer of glue and then a layer of filling material is placed on the surface of the tooth; and with repeating this method the filling is made layer by layer. The layers are lit with a blue light that hardens the filling material. The surface of the filling is formed to the right shape with a drill. In the end, the dentist polishes the surface of the tooth. Potential complications after filling: sensitivity to cold or warm may occur that can last for one or two weeks. 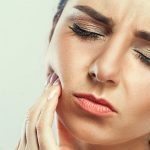 Patients may feel masticatory pain (this can be ceased with the correction of the filling), and the place of the injection may also be sensitive for a while. As a result of having coffee, tea, coke or smoking or some food colouring, the filling may discolour along with the teeth. Injured or shortened frontal teeth can be restored with aesthetic filling material that are the same colour (and the same transparent at the edges) as the original teeth. Inlay is a type of filling that is made by a dental technologist; it is suitable for a partial or full reconstruction of the occlusal surface of the molar. Also, it is a solution to massive dental caries, broken teeth, tooth edge restoration and for raising the bite (in case of a too powerful bite). It is more permanent than traditional aesthetic fillings as – after making the impression – it is produced under industrial conditions, on high temperature and pressure. The ready-made inlay is glued to the previously prepared hole, securing the closing at the edge of the tooth and the inlay. Inlays can be made of plastic (glass-reinforced), ceramics or golden ceramics.